A critical trait that distinguishes modern humans from all other species alive today is the ability to make complex tools. It’s not just the extraordinarily powerful human brain, but also the human hand, that gives humans this unique ability. In contrast, apes humans’ closest living relatives lack a powerful and precise enough grip to create and use complex tools effectively. A key anatomical feature of the modern human hand is the third metacarpal, a bone in the palm that connects the middle finger to the wrist. “We had thought the modern human hand was something relatively recent, maybe something that appeared as a recent addition near the origin of our species,” Ward told LiveScience. Now, researchers have discovered a fossil almost 1.5 million years old that possesses this vital anatomical feature, meaning it existed more than 500,000 years earlier than it was previously known to have existed. “This suggests this feature might be fundamental to the origin of the genus Homo,” Ward said. 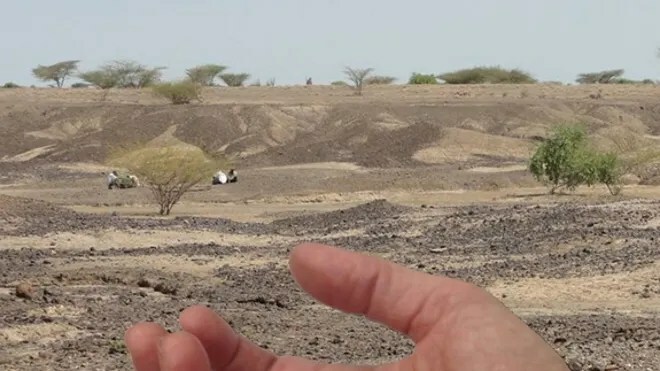 The scientists discovered a third metacarpal bone in northern Kenya, west of Lake Turkana. The fossil was found near the sites where the earliest Acheulean tools named for St. Acheul in France where tools from this culture were first discovered in 1847 were unearthed. The Acheulean artifacts were the first known complex stone tools, rough hand axes and cleavers that first appeared some 1.8 million years ago. The hand-bone fossil is about 1.42 million years old. The researchers suspect it belonged to the extinct human species Homo erectus, the earliest undisputed predecessor of modern humans. By revealing the early human lineage had a modern handlike anatomy, the fossil “suggests this feature may have [been] a pre-adaptation that helped set the stage for all the technology that came later,” Ward said. Ward and her colleagues detailed their findings online Dec. 16 in the journal Proceedings of the National Academy of Sciences.